I have a lot of friends that are interested in decorating with original art. Oftentimes, though, they have the mindset that it’s too expensive to do so. I have come to find that, by attending an art festival, anyone can have great art to decorate with at a reasonable price. Buying art at a festival is a great way to save some money. You will find a wide array of artists with many different styles at a festival. Maybe you’re looking for a sculpture for your garden or a painting for your wall. You will likely find anything you’re looking for there. Who know, you may even buy something that is worth a lot someday. If you are merely looking for an investment opportunity, an art festival is a wonderful way to find pieces to invest in. There are so many options there to choose from! Even if you’re not ready to make a purchase yet, an art festival is a great place to go for ideas on what you like and may want to buy in the future. Maybe you need to figure out your tastes in art. Regardless, an art festival is a great way to spend a day. Oftentimes, people search for products that are homemade at art festivals. You can usually find a lot of options for homemade jewelry at an art festival. There are many people usually selling beaded jewelry, as well as jewelry made with turquoise and/or silver. Most of what you find will be much better quality than you can find at your local Walmart. Another great thing to explore at art festivals are crafts. Most of us enjoy crafts but may not have the ability or time to make them ourselves. If you do, though, an art festival is a great way to make a little money from your hobby. 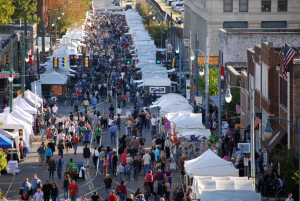 In most areas, art festivals are a yearly event. If you need to find one nearby, the internet will be a great tool for you. Even if there isn’t one close to you, taking the time to go to one elsewhere will be well worth your time if you truly love art. They are very rewarding for both the artists and those who attend. I know I look forward to art festivals every year.